Ok guys, since I was going to rebuild, clean and change the seals in my brake calipers, I thought I'd make this tutorial. Everyone has his own way but this is mine and I'm sticking to it. It might come in handy for those who never done it or are having problems with their brakes. It might be a sticking piston, a leaking seal or a sticking floating button and without digging in you can never know. In my case I had a sticking piston on the left caliper that was causing some vibration and unbalance when coming to a stop. This is specifically for the F4i but all opposed pistons calipers will be pretty much the same. 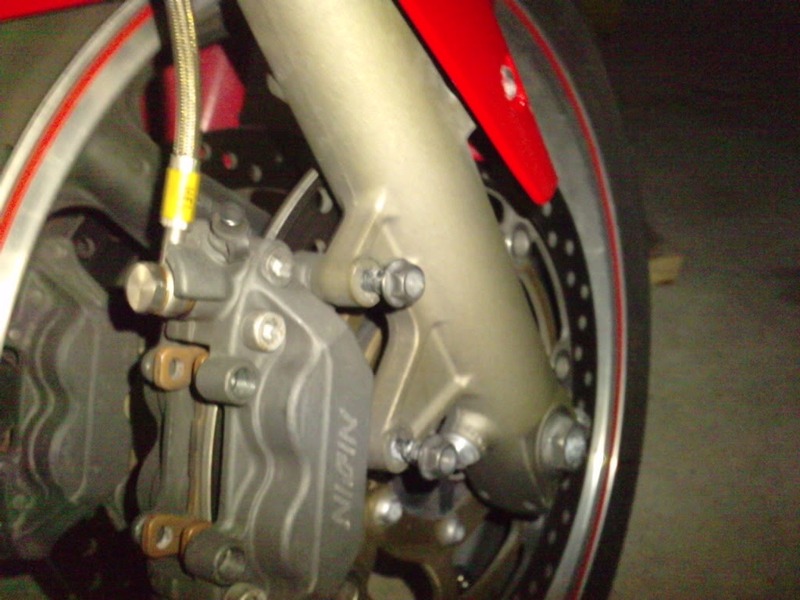 Ok, the first thing you want to do is to remove the pins that hold the dust shields from the calipers. 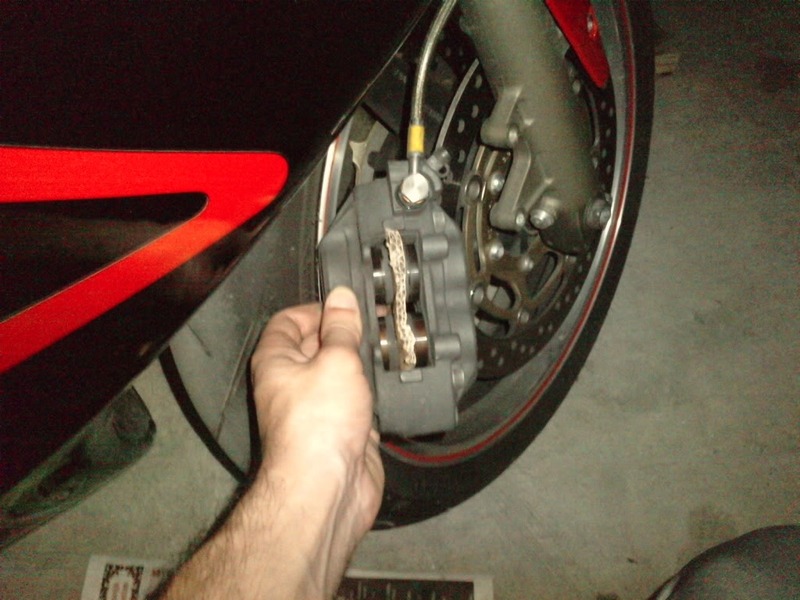 At this point, I slightly unscrew the banjo bolts at the caliper but leave it tight. Grab the front brake and pump it until the pistons grab the cardboard and stay there tight. I do it like this cuz' it's easyer to pull the pistons out when you split the caliper halves. Now, take your caliper to the work bench it's cleaning time. Depending on how bad your pistons are, they might come out with your hand, sometimes I’ve had to use pliers. If you need to do this, use electrical tape to tape around the teeth a few times so as not to damage them and also wrap a cloth around the pistons and pliers. Try to grab as little as you can on the piston. Hold the calliper half and use the pliers to grip the piston and rotate it in the calliper whilst pulling at the same time. It can take a while, but it will eventually come out. Repeat the process for the other pistons. When you see the seals, remove them very carefully and bin them if you have new ones. 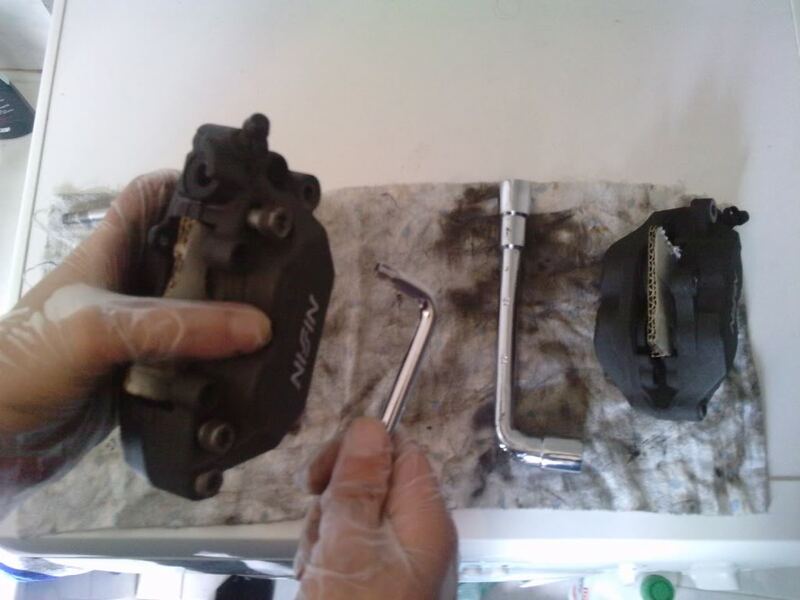 After all is cleaned, grab your brake cleaner spray and give it a blast on the calipers to remove anything that might have been left behind. It also helps to remove any moisture and water. 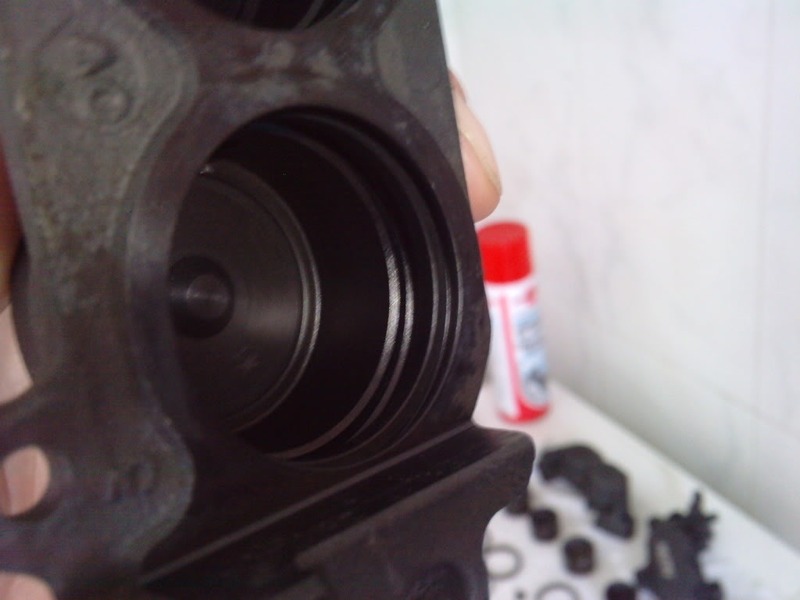 Pack the seal grooves with some rubber grease and fit the seals. 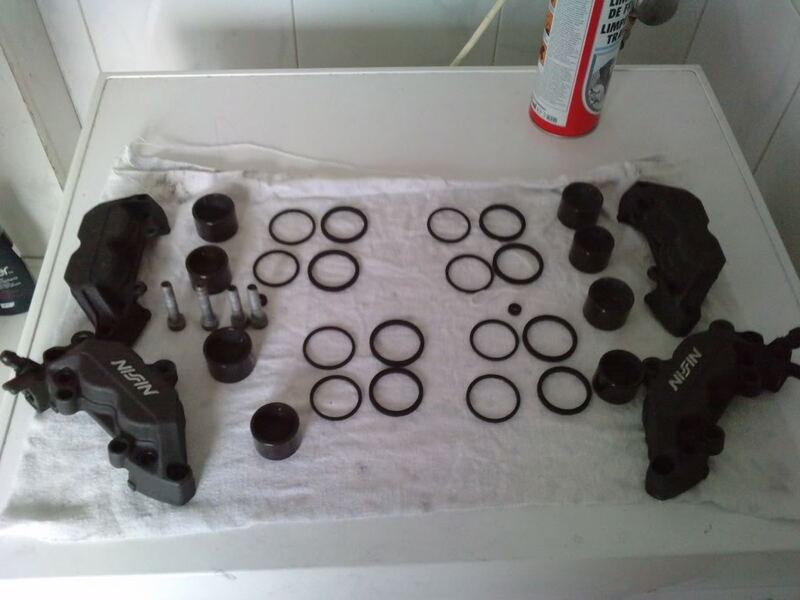 Once they are all cleaned, dip a finger into the old brake fluid and coat the piston chamber and seals in the calliper halves, then dip the piston into the fluid and coat them before refitting to the piston chambers. This will help them slip past the seals with ease. 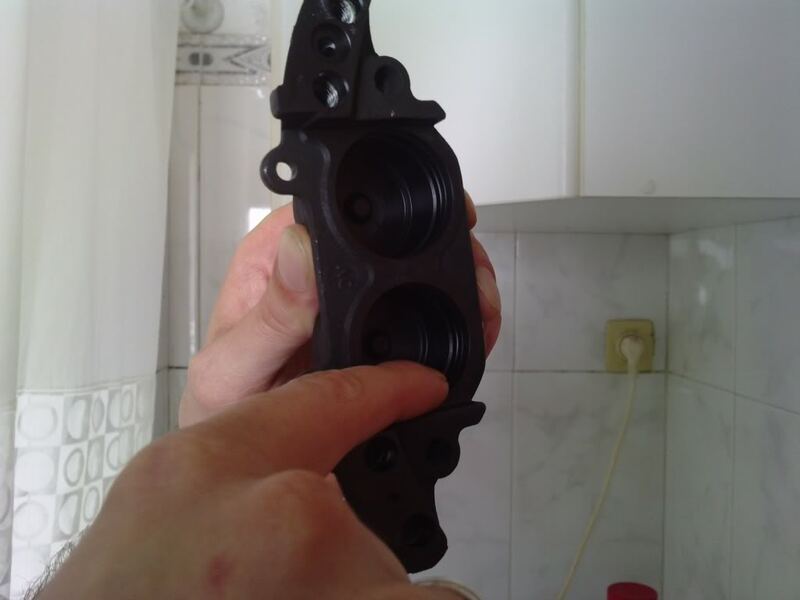 Make sure the seals are seated correctly before joining the calliper halves. Screw the halves together, but don’t over tighten. I leave the torqueing for after they're fitted to the bike, it's much easyer. That's it, you now have fresh brakes! Just install in reverse order. At this time I usually clean and oil up my floating rotor buttons, cuz'if they start to stick you might warp your rotors. Last edited by Slick 6; 05-04-2011 at 03:15 PM. Your welcome man, it's nice to retribute. Wow! Very smooth, I've done this before, but this would have taken a lot of the "hmmm" factor out. Very nice documentation. Thanks for sharing. awesome work and thanks for the pix. 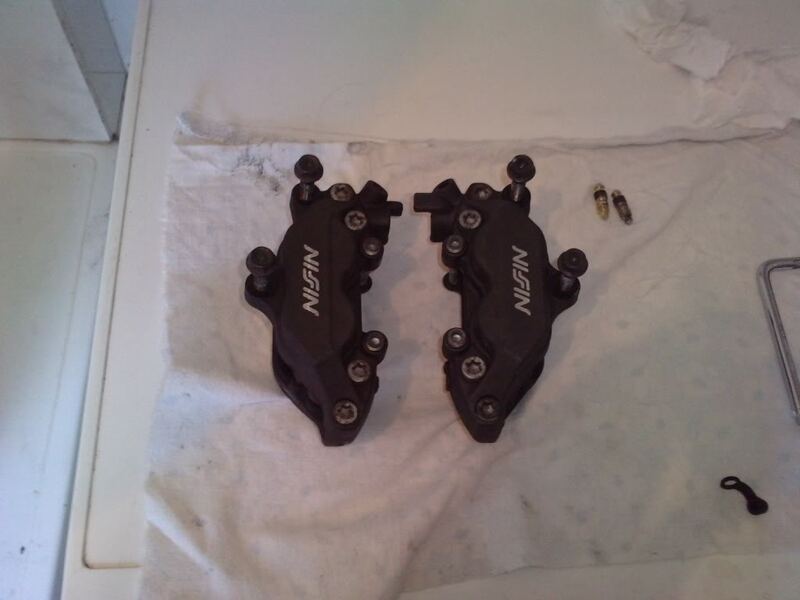 Looking to do this on my calipers to powdercoat them. bookmarked! 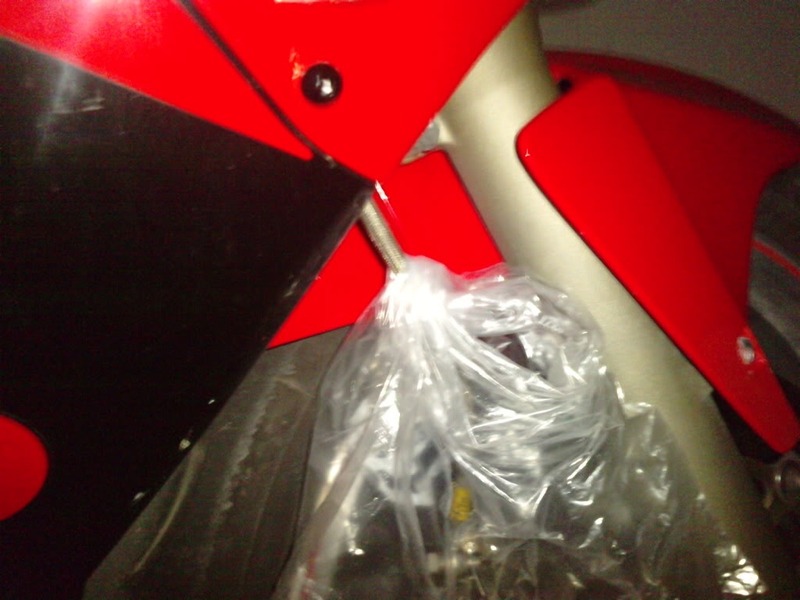 If you're powdercoating them be sure to seal off the working parts really good, you do not want paint in there. I was thinking of that too but my brother can't do it now so it will stay for another time. Shows us the the result after, bro. What kind of rubber grease are you using? 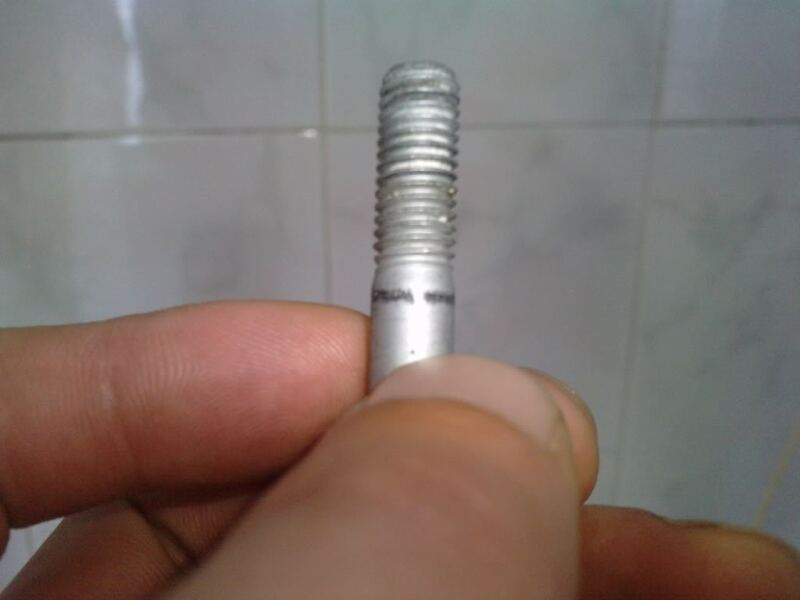 Also, how long after applying the Loctite do I have before torquing down the bolts? I assume I can't let it sit for a week or two before reinstalling them? Edit: Is there a difference between 06451-MCJ-405 and 06451-MCJ-751, besides the price? RonAyers has both listed for the same seal, but it looks like it's going to be somewhere between $80 - $150 to redo all three brake calipers, depending on which seals are acceptable. The grease is regular silicone/rubber which comes in a tube. I don't think you have the same brands over there. Maybe some other user can chime in on brands...? 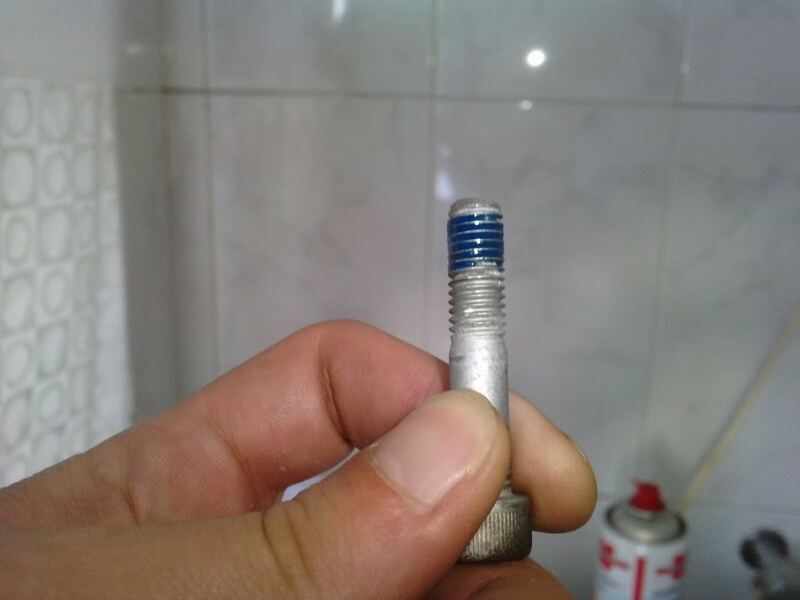 Regarding the Loctite, it should be used immediately before assembly and you do have the chance to torque it after a while but I wouldn't recommend that long. 48h tops. I had the same question as you, it seems the seals are listed as being the same but they're actually not. Talked to a friend that work for Honda dealer and unfortunately, the cheaper ones are for the F4 up to 2000. He just doesn't know what the differences are but he thinks that Honda revised the thickness of the rubber The costier are the ones you want for the F4i. You can do the same as I did. Remove all seals and dispose of the dust seals. 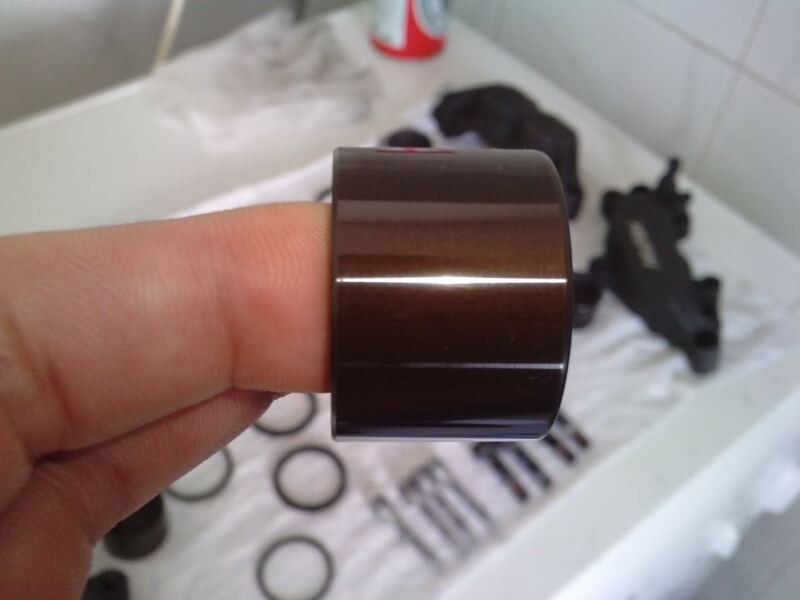 Clean and inspect the oil seals and if they look ok, not ripped or streched, it'll be safe to reuse them. But at least get the dust seals, those are the ones that get "abused". 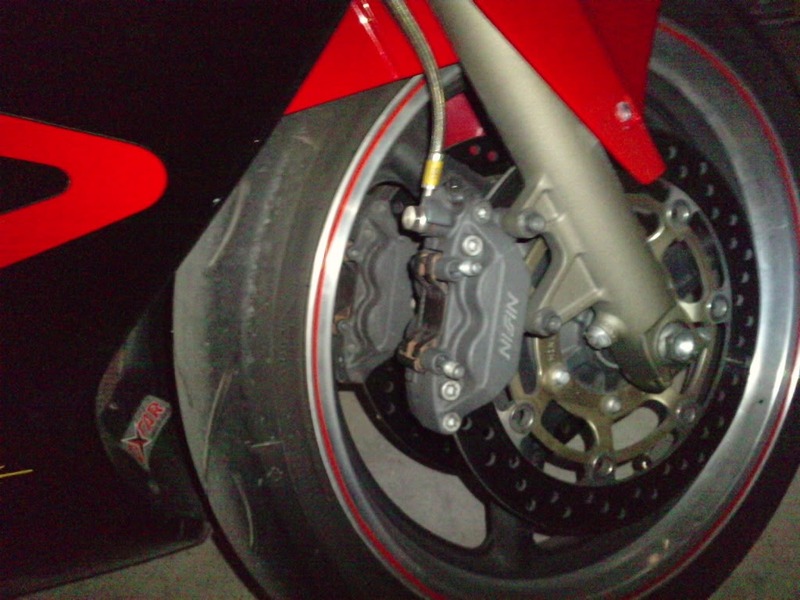 The ones closer to the out side of the caliper.